Melody Hedden, (Family and Community Services Manager) and Christine Young (Identification and Recruitment Manager) at Tri-Valley Opportunity Council, Inc. in Crookston recently completed training at University of California, Los Angeles’ (UCLA) Head Start Management Fellows Program. They were two of 38 graduates from UCLA’s intensive leadership program. 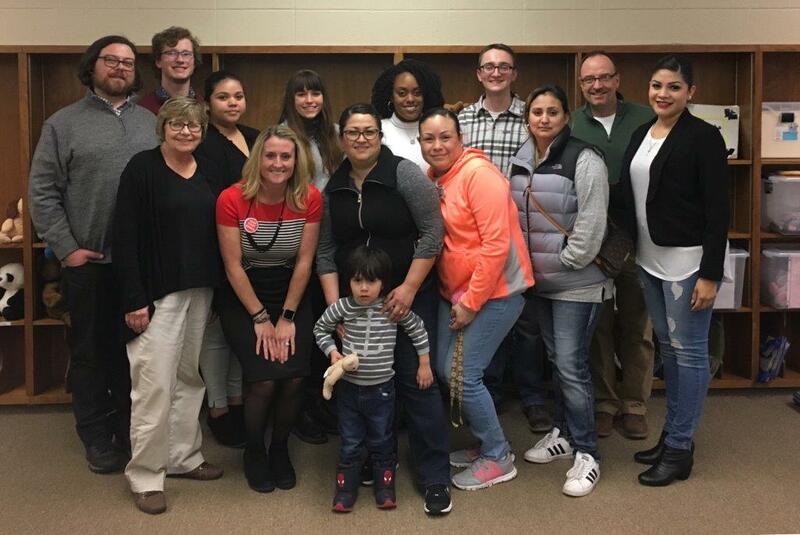 “The Head Start Management Fellows Program played a vital role in moving me from a “shouldn’t have been to a look at me now.” I was a Head Start child who transitioned into a Head Start parent and later a Head Start staff person,” states Hedden. “Head Start has been loyal in supporting and encouraging my professional development, which led to applying to the fellowship program. 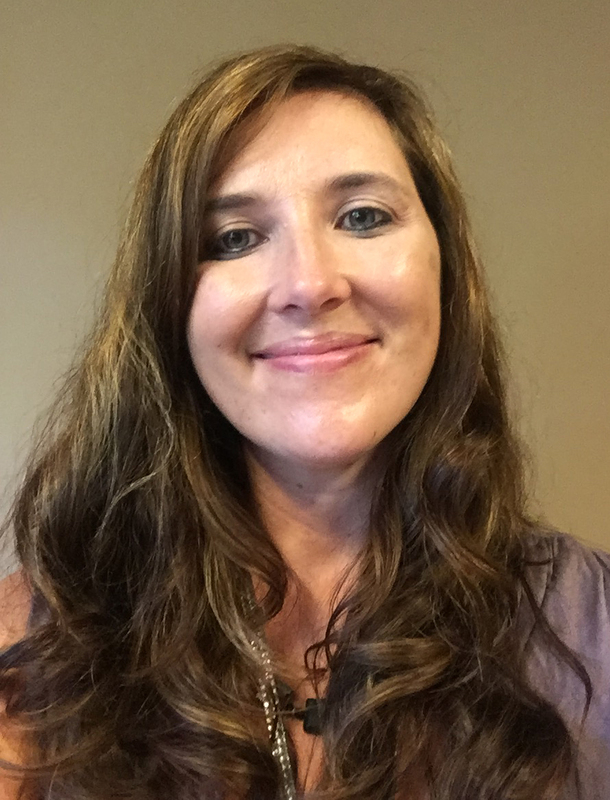 Through the classes at UCLA, I developed and sharpened skills that will be vital in supporting children and families,” Hedden adds. Throughout the program, participants are taught how to lead effectively and deliver developmental services in changing environments, secure funding, implement programs and network with other Head Start executives across the nation. Since the program’s inception, 1,560 executives have graduated with enhanced management and leadership abilities. Designed from a strategic planning perspective, the UCLA Head Start Management Fellows Program provides a unique opportunity for Head Start executives to participate in a 12-day, intensive leadership and management development training session at UCLA Anderson School of Management. Since 1991, the program has trained over 1,400 Head Start directors and managers who provide comprehensive services to nearly 1 million economically disadvantaged children and their families each day. 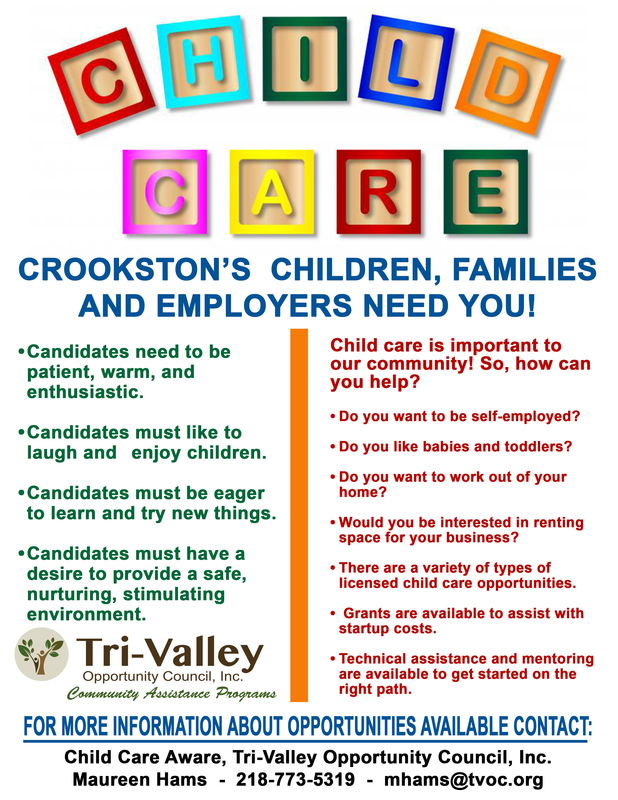 (Le Center, Minn.)- One of Tri-Valley Opportunity Council, Inc.’s Head Start, Child and Family Program’s Administrative Office is excited to now be located in the community of Le Center. For that reason, the Head Start office plans to hold an open house for the Le Center and surrounding communities on Friday, August 10th from 10 am – 7:30 pm. The office is located at 200 East Bowler Street and there will be cookies, refreshments and games. Tri-Valley has been a part of the Le Center community since 2001. The Migrant and Seasonal Head Start serves Le Sueur County and was in Montgomery from 2001 to 2008 and moved to Elysian where it currently is since 2009. Tri-Valley Opportunity Council is contracted with the Minnesota Department of Education to identify and recruit students ages zero to under 22 that have not graduated and qualify for the Title I Part C Education of Migratory Children. The Head Start Program serves children 6 weeks to 5 years of age and pregnant women. Transportation, health services, education services, and family services are included in the Head Start Program that typically runs from May to November. Migrant and Seasonal Head Start services are provided to 792 children, pregnant women, and families through center-based options in Minnesota and North Dakota. The goal of the project is to provide comprehensive services to children and their families building upon successful operating practices already in place. Tri-Valley’s mission is to provide opportunities to improve the quality of life for people and communities. Community Services: programs include Child Care Resource & Referral, Community Assistance Programs (LIHEAP, SNAP, etc.). Transportation Programs: provides public transportation services in eight counties in northwest Minnesota. Senior Programs: programs include the Foster Grandparent Program and the Caring Companion Program. Head Start, Child & Family Programs: programs the Region V Head Start and Early Head Start, Region XII Migrant and Seasonal Head Start and Early Head Start, Migrant Child Care Child Care, Title I Part C Recruitment and Identification, Title I Part C Health Services, and the Summer Food Service Program. Courtesy of the Le Center Leader. Local Head Start executive Christine Young completed some training that will ultimately benefit children and their families from the Tri-Valley Opportunity Council, Inc., in Le Center, MN. Young is one of 38 graduates of the 2018 University of California, Los Angeles (UCLA) Head Start Management Fellows Program. This program is an intensive 12-day leadership and management development program, conducted at the UCLA Anderson School of Management. “Head Start creates the foundation for a wonderful future for children and their families,” said Yasmine Daniel-Vargas, director of the National Center on Program Management and Fiscal Operations. The program was developed in 1991 to strengthen the management and leadership skills of Head Start administrators and is currently funded by the Head Start National Center on Program and Management and Fiscal Operations. Head Start programs provide comprehensive developmental services to low-income preschool children and their families. Head Start also provides a range of medical, dental, mental health and nutrition care as well as parent involvement services. Program directors supervise nearly 259,000 paid staff and more than one million volunteers nationwide. In 2016-17, Head Start programs served 1,070,000 children ages birth to five and pregnant moms, making a total of more than 35 million since its inception in 1965. Maureen Hams has been at this for a long time, since 1989, to be exact. 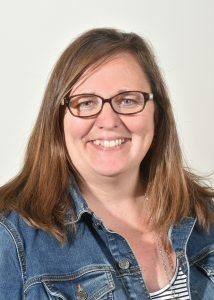 She supervises several programs under the large Tri-Valley Opportunity Council umbrella, and one of them is Child Care Aware, which provides technical assistance, resources, and other forms of support to child care providers and parents, as well as communities who are looking to grow their licensed child care options. In other words, Hams is an expert, an expert who’s never seen a child care shortage in Crookston as severe as the current one. 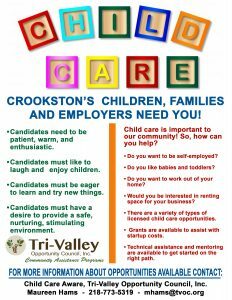 The thing is, when the Minnesota Department of Employment and Economic Development last year awarded a $50,000 grant to Tri-Valley to work specifically on reducing the shortage, in partnership with the City of Crookston and other stakeholders, Hams figured all of the money would have been given out by now, in the form of mini-grants to new licensed child care providers. But that’s far from the case. As of this week, only four mini-grants have been awarded, eating up only $8,000 of the $50,000 grant. 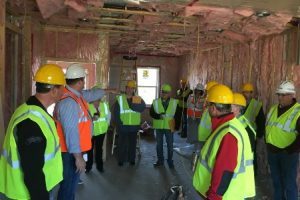 The window to spend the grant money has already been extended once by the state, Hams said, but the Dec. 31, 2018 deadline to spend it all or give it back will be here in no time, meaning progress better ramp up significantly and in short order. City Administrator Shannon Stassen, who serves on the committee formed to address the shortage and has had many discussions with Hams, said he remains confident that “Crookston will see an increased number of child care slots” over the next year. But on the other hand, child care providers get to be their own boss, they get to set their own hours, and they choose families and kids that are the best fit with them philosophically, Hams added. “Of course the family is interviewing you as well, but that’s what’s beautiful about this…finding the best fit both ways,” she said. According to Hams’ latest data, Crookston is currently home to approximately 180 licensed home-based child care slots, and 164 child care center-based slots, such as the Children’s Center at the U of M Crookston or the Sunrise Center at the Cathedral Church. The initial goal of the grant was to add 130 licensed child care slots in Crookston, Hams said, and by far the greatest need right now is for infant slots. In an “initial gap analysis” for Crookston, it was indicated that the community needed 121 more spaces for infants alone. As more time has passed and the grant’s impact has lagged behind expectations, a storyline has emerged that new providers are hesitant to enter the licensed child care field because the myriad of rules and regulations are too strict. While Hams said she hears various complaints from time to time from experienced providers when the association of local providers gets together for meetings, she also thinks that new providers might be more willing to accept the regulations, even some of the newer ones that have been especially criticized, because they don’t know any better, and they might actually want as much guidance and direction as they can get. In her view, Hams said concerns about regulations pale in comparison to lack of health insurance for child care providers. “If you need health insurance, this is not the business for you,” she noted. Hams acknowledges that providing so many new licensed child care spaces in Crookston is going to be even more of an uphill battle if a few slots are simply added here and then via home-based child care operations. A “center-based solution” would obviously have a bigger impact, but she also knows that opening a child care center or two involves a much larger scope, likely more partners, and a lot more money. “On the infants and toddlers solution alone, a center would be a really big step,” Hams said, adding that she thinks incorporating a center-based approach as stakeholders work to add child care spaces in Crookston is wise. “Yes, it’s expensive, yes, there are regulations, but for a community the size of Crookston, a center is a realistic option,” she said. The poster child that is spurring growing interest in child care operations on a similar scope is found in Detroit Lakes, Hams said, where the operation revolves around Head Start. “The state is wondering if it’s a good idea to do it without the Head Start collaboration,” she said, adding that the debate might end up involving the legislature at some point. When Hams attends gatherings of the local child care provider group, she hears constant chatter about the shortage, who’s getting the most calls from parents in search of child care, who has the longest waiting list, etc. She heard one provider recently had a waiting list 26 names long. Experienced providers are retiring, she said, and there’s no one to fill the void. Whether it’s local businesses not being able to attract workers or school district enrollment suffering, Hams said she agrees that at some point a child care shortage of the degree Crookston is currently experience does “start to stunt” community growth and progress. Hams said efforts to publicize the grant have run the gamut. Efforts have especially been made to target young families that might see the benefit of having a parent watch their own children for free at home while getting paid to take care of children from other families, Hams noted. Word of mouth is often an effective tool, too. The fact that the extreme child care shortage remains in Crookston and that investments courtesy of the grant have been painstakingly slow to transpire hasn’t dampened Hams’ enthusiasm. If nothing else, it’s shown how critically employment high-quality and high-quantity child care is to a community, and even a region. With summer right around the corner, it’s time to think about how children who receive free or reduced-priced lunch in school will eat healthy while school is out. Tri-Valley Opportunity Council, Inc. provides free meals to children during the summer. Eleven of Tri-Valley’s centers throughout Minnesota and one in North Dakota will offer Summer Food Service Programs. Locations include, Breckenridge, Brooten, Crookston, Danube, East Grand Forks, Elysian, Glencoe, Grafton (ND), Owatonna, Sleepy Eye, and St. Cloud. Center locations and times of service can be found at www.tvoc.org. Other questions can be directed toward Jami or Deb at 218-281-5832 or 1-800-584-7020. Summer Food Service Programs (SFSP) are a federal child nutrition program funded by the USDA. SFSP is designed to provide healthy meals during the months of June, July, August, and September when school is out to kids and teens ages 18 and under and available to persons with disabilities, over 18, and who participate in school programs for people who are mentally or physically disabled. The Crookston Housing and Economic Development Authority (CHEDA) brought the board, city council, Crookston Chamber of Commerce, and other interested parties on a tour of housing options in Crookston after their meeting on Tuesday morning. Two of the townhome buildings are up with work being done on the inside while the framing of a third building is currently being worked on. 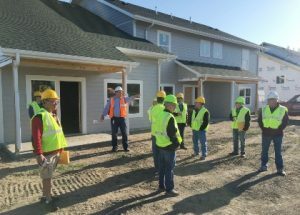 “When the foundation is complete (on the third building), they will move to the south side of the property and build three more buildings which will generally be the same orientation with smaller buildings close to the middle of the property and a larger on the south end of the property line,” said Carlson. (Elysian, Minn.)- On Monday, March 26, Josh Syrjamali, Chief of Staff for Congressman Tim Walz, and five of Congressman Walz’s staff visited the Elysian Area Learning Center. The purpose of their visit was to learn more about the Migrant and Seasonal Head Start program as well as the needs of early childhood programming in the rural service area. In addition to Congressman Walz’s staff, Tri-Valley’s staff of Lindsay Vokaty, Edna Tudon, Cindy Strand, and Anita Swift were joined by Migrant and Seasonal Head Start parents: Monica Garcia and Juanita Picazo and Policy Council members, Diana Escamilla and Sondra Gongora, as well as one of our star toddler students from last summer. The discussion covered a variety of topics that were important to Head Start and Migrant and Seasonal Head start. Diana and Sandra shared information about the role of Policy Council in head start as well as some of their personal experiences as a PC member. Parents discussed how much their children benefited from the Head Start school readiness program – stating that when their children entered kindergarten teachers were so impressed with the knowledge, social skills, and confidence the children brought with them. Concerns that we heard from all parents was the difficulty in finding qualified teachers, transportation, funding, and length of services. Discussion also included the impact of stricter immigration enforcement, the lack of funding for the agriculture bill, school readiness, professional development, and several other issues that affect people living in rural areas. A regional follow up meeting will be held on Thursday, April 12 in Waseca. This meeting will continue the conversations that were started across southern Minnesota during the staffer’s tour of the area. Anita, Cindy, and (hopefully) two parents will be attending this Regional Vitality Summit. If you are currently working at a nonprofit in the Northwest region, you are invited to join this free, informal discussion and information sharing group hosted by the Minnesota Council of Nonprofits. 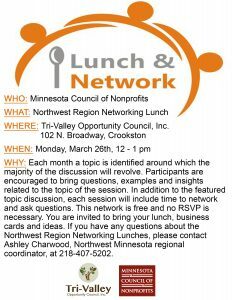 The networking lunch will be held at Tri-Valley Opportunity Council, Inc. in Crookston on Monday, March 26 from 12 – 1 pm. There is no charge for this event. Each month at the networking lunch, a topic is identified around which the majority of the discussion will revolve. Participants are encouraged to share questions, examples and insights related to the topic discussed in the session. In addition to the featured topic discussion, each session will include time to network and ask questions. This network is free and no RSVP is necessary. You are invited to bring your lunch, business cards and ideas. 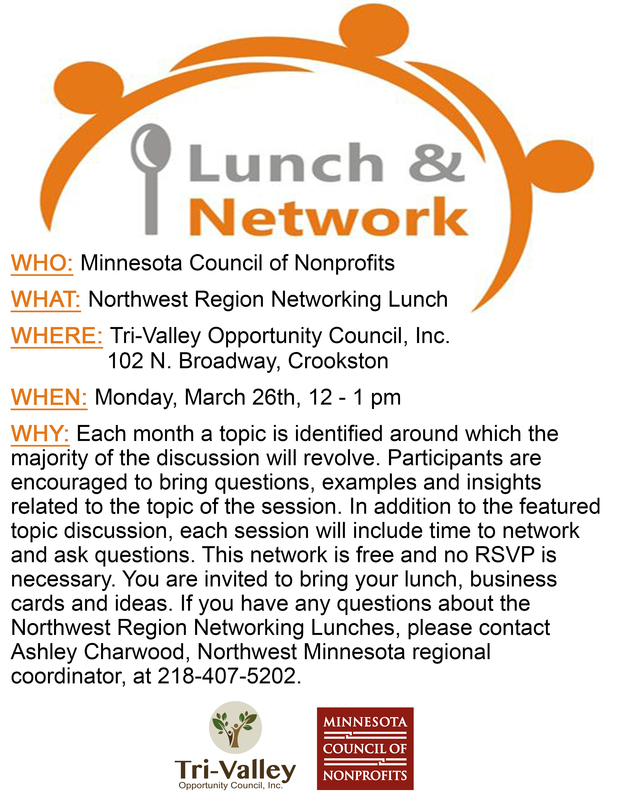 If you have any questions about the Northwest Region Networking Lunches, please contact Ashley Charwood, Northwest Minnesota regional coordinator, at acharwood@minnesotanonprofits.org or 218-407-5202. Representatives Betty McCollum (DFL-Minn.) and Lloyd Smucker (R-Pa.) last week introduced bipartisan legislation to authorize $250 million in federal funding over five years to help communities respond to the needs of low-income people and families in crisis because of the opioid epidemic. The Community Action Opioid Response Act, H.R. 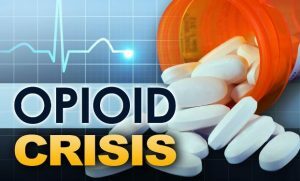 5124, establishes a competitive grant program to expand and support effective community efforts to identify and respond to the causes and consequences of opioid misuse and addiction experienced by low-income individuals, families, and communities. Uniquely positioned to address these needs, Community Action Agencies would compete for three-year grants ranging from $50,000 to $1 million per year. Grants under the Community Action Opioid Response Act could support a wide range of activities designed to prevent and treat addiction, stabilize the lives of addicted individuals and their families, and support the children of addicted individuals. Grant applicants would undergo rigorous screening by a 15-member review panel under the Department of Health and Human Services. There are more than 1,000 Community Action Agencies across the country, each governed by a board that represents all sectors of the local community, including its low-income residents. Funded through the Community Services Block Grant, they have well-established and wide-ranging networks of private and public partners, including health care providers, social service organizations, the judicial system, local governments, and thousands of local volunteers.